In fact, research suggests that by 2020, 30% of digital commerce revenue growth will be attributable to Artificial Intelligence (AI) and analytics. 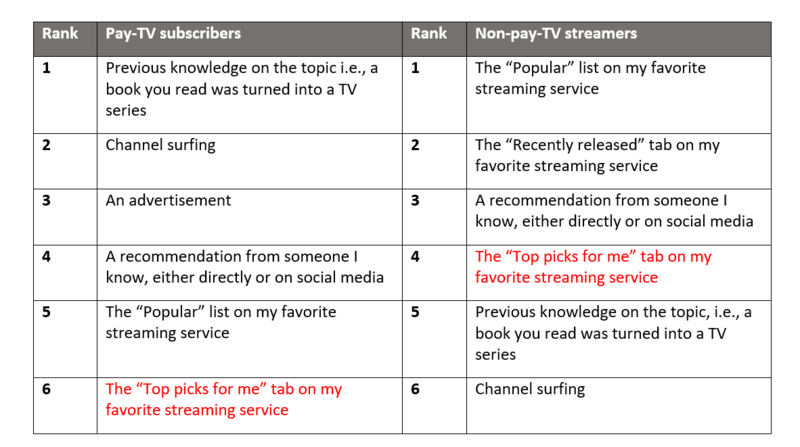 As a content marketer, imagine if you were able to microsegment your readers in the moment and understand which content to best show them to drive subscriptions (or continued subscription). If that sounds appealing to you, read on. Just look at the renewed importance of first-party data (data you own). In the past, third-party data, or data collected from aggregators, was considered the best way to market to customers. However, privacy concerns (it includes things like purchase and browsing history) have made it less viable. First-party data, on the other hand, includes website traffic statistics, owned email marketing data, e-commerce data, and the content you publish and promote on your site. The best part is that it’s completely within your control. Also, it builds on itself over the years, which gives you deeper insights than you could have obtained through third-party data alone. Today, content companies that leverage first-party data are better-positioned to make content recommendations and provide better customer experiences. But to give your customers, users, and readers what they want, you need to be able to process and react to data in less than one second. And assembling, analyzing, and interpreting the data is no small feat. According to 2018 data from Nielsen, Americans spend more than 11 hours consuming various forms of media. 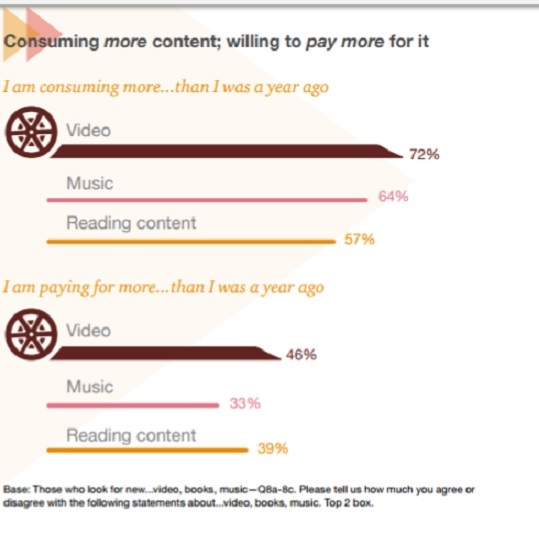 And adults between the ages of 18-34 spend as much as 43% of their time reading and viewing media on various digital platforms—a number that’s almost certainly higher today. All of which is to say: There’s more first-party data up for grabs than ever before. However, today’s users also expect that content to be relevant. That’s why the most effective content providers not only need to provide content that readers care about, but also content that’s highly tailored to their experiences in that moment. And in the era of digital transformation, where AI-driven businesses are poised to take in close to $3 trillion, you need a data strategy that performs efficiently. AI, combined with traditional analytics, can help your company comb through huge amounts of data in real time. And every day you put it off, the data set grows even larger and harder to manage. Data scientists are often too bogged down with grunt work to focus on what matters. Today’s tech clutter (the average business today uses roughly 129 apps) creates data silos that make effective communication nearly impossible. According to a Deloitte survey, 52% of respondents said they couldn’t make information-backed decisions because the data they needed is trapped in siloed departments. When data is isolated, it’s hard to wrangle and figure out how to analyze it. So data scientists find themselves spending 80% of their time on mundane work like figuring out which data to use, managing data movement on and off the Cloud, and understanding what attributes make the most sense to use in your models. And after all that grunt work, there just isn’t time to do the high-value analysis. So when you ask your data science team to tackle a portion of data, you may not understand there are many different moving parts that have to come together besides the analytics. And just because your data scientists have PhDs in mathematics or statistics doesn’t mean they have the expertise in data engineering and management to get it all done. All CEOs need to make sure there’s a programmatic and structured way to enable data science to be ingrained in the data culture—not an afterthought. This means prioritizing building and updating the infrastructure so that there’s time for the most important analysis. A strong data science platform makes room for truly valuable analysis. A lot of the businesses we work with at my customer engagement company, LiftIgnigter, say it’s the operationalizing or the engineering part of data analysis that’s the most time-consuming. It is easy to become overwhelmed by the challenge of turning data into an integral component of business operations—companies often don’t know where or how to begin. To access the value of your business’s data, your data science team needs to develop not only a clear data strategy, but also find a programmatic way to make this second nature. Typically, this requires either building a platform or leveraging a third-party platform. A third-party platform helps data science teams aggregate the data, ultimately making data analysis a much more democratic process. But it’s equally critical that the platform is built and fine-tuned for your company’s specific needs. A generic platform may give you lots of different options to run model testing, but at the end of the day, you need to focus your effort on modeling that is the most likely to yield meaningful insights. However, with the right platform, which typically combines data science and machine learning, a team of five people can be effective as a team of 50. Imagine how much more efficient your team would be if they could focus their time on higher-level analysis. AI augments the work your data science team can do, in real time. With AI becoming increasingly ubiquitous, people are worried it will take their jobs. But AI isn’t replacing the data scientist. It’s actually making them that much more effective. Here’s why: Training user targeting models is one thing. But then your team has to figure out a way to operationalize the continuous updating of the data. For example, a large publisher company with 40 data scientists can still take several days to do all of the analytics that their editorial or product teams are demanding in real-time. They can hire 1,000 people—but that’s not cost-effective. The data science team is often called on to find compelling nuggets in your data in real-time. They’re constantly bombarded by your revenue team and marketing teams to come up with the perfect segment that will help drive greater revenue. Large media companies like Facebook have a keen advantage because they have armies of data scientists to dig through their mounting data and figure out what’s relevant. And this is where AI comes in. In order to compete, your business needs to make that process as standardized, real-time, and with zero wasted effort. Third-party platforms enable businesses to create, tune, and refresh high performing models efficiently. Whether it’s generating demographic data for audience creation, or live streaming user behavioral signals to train a targeting system, a third-party platform can do a lot of the heavy lifting for you. If you can create a unified strategy across your organization, optimize the data you have, and work only with trustworthy third-party partners—you’ll be prepared to navigate this new landscape. Artificial intelligence (AI) is being used more and more in ad tech to solve a variety of problems. Between the high profile acquisitions and its rise as the industry’s latest favorite buzzword, it’s clear that AI is an extremely powerful tool. However, it’s definitely not a silver bullet. Let’s take a look into a few AI pros and cons. Workflow Efficiencies: One of the largest benefits of AI is how much time it can save on the user side. Without AI, proper campaign optimization takes a lot of time and is absolutely more art than science. Just consider how much data is available on each individual. Even with a target persona in mind, sifting through vendors and guessing at which attributes will perform best is a costly and time consuming exercise at best. Once that’s done, the ad trafficker then needs to toggle pacing, pricing, and potentially dozens of other variables. AI can automate much of that. At which point, the user just needs to pick a goal the AI can optimize toward and let it run giving directional guidance where necessary. More Data Processing than Humanly Possible: Big data and AI go hand in hand regardless of the industry. JP Morgan even published a massive white paper on how they think those two trends will affect investing. When it comes down to it, programmatic trading isn’t all that different from programmatic advertising. It’s all about automated buying and selling to maximize value. AI can “see” and consider as many features as it’s been trained to, considering hundreds or even thousands of variables over the course of a campaign to determine significance. That’s just not something humans can do in any cost-efficient manner. ROI: What happens when you put workflow efficiencies and maximum data activation together? Cost savings. Lots of it. Assuming your AI strategy is working (and your mileage may vary), adopters of AI stand to reap massive benefits. Since AI requires less human capital to operate, adopters stand to gain from not having to hire as many heads and the heads they do hire aren’t focused on tweaking knobs and levers manually. Additionally, since AI learns as it goes, performance constantly improves over time as it begins to distinguish between what’s important and what’s irrelevant. Black Box Algorithms: Unless you’re building your own, it’s pretty difficult to know exactly how an AI algorithm works. Two primary reasons for this: 1) The features an algorithm considers are typically a company’s secret sauce, and asking a company to publicize everything that goes in is like asking KFC to share their 11 herbs and spices. 2) Even if there is a degree of visibility into what features are being considered for optimization, oftentimes the amount of data being processed is more than what a human can parsethrough (see Pro #2). Which begs the question…what’s the point of performance if you can’t explain it? Not All AI is Made Equally: If AI is a brain made to learn for a specific purpose, who’s to say whether you’ve chosen the AI equivalent of Einstein or your bratty seven-year-old neighbor? Every partner’s going to represent themselves like they’re Watson, but realistically, that’s impossible. Some partners are better for specific industries, some are probably pure vaporware. Choosing the right partner isn’t easy, and if everyone’s offering an AI solution it’s difficult to say which is the best one for you without at least some degree of upfront investment and a decent amount of research. ROI: Similar to how properly implemented AI can generate huge savings, it can also be a massive sunk cost. The initial barrier to entry – either investing in developing your own algorithms or paying a partner to use theirs – is going to be fairly substantial for most advertisers or publishers. There’s also no guarantee that it’ll work in every scenario. As much as partners would love for you to believe that their AI will make it rain gold bricks every Sunday, that’s just not true. When choosing a partner, don’t just think about their historic performance, but also whether they meet your needs in terms of transparency in both costs and reporting. As far as AI pros and cons go, it’s hard to say whether AI is right for you. That said, AI is becoming an increasingly important part of a greater shift in the digital advertising ecosystem, and I’m personally interested in seeing how it adapts to other trends. Will AI specced for second price auctions succeed in first price environments? How about in a post-GDPR world? Will the new data restrictions affect performance and will new strategies arise as a result? Who knows, but I’m looking forward to finding out! Journalists today are using Artificial intelligence (AI) in newsroom as part of their daily reporting process. The Tow Center for Digital Journalism and the Brown Institute for Media Innovation’s research report, Artificial Intelligence: Practice and Implications for Journalism, discusses new AI developments and the impact on news organizations. Today, more and more resources are available digitally. The days of manually searching for data in basement archives are long gone. However, given all of the digital resources available, the process requires significant human effort. AI and automated journalistic processes can help ease that burden. 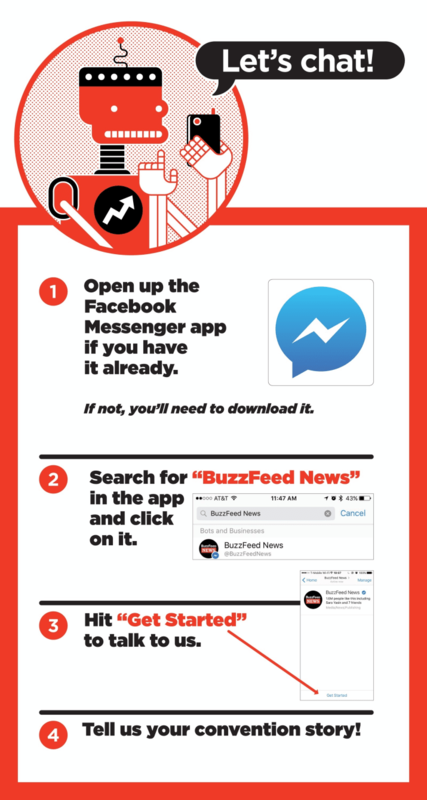 BuzzFeed’s BuzzBot allows the collection of information from on-the-ground new sources. Finding needles in haystacks: AI can find and fact-check faster than the human eye. Identifying trends: AI can parse through data, again faster than humans, and group findings into categories to identify trends. Examining an application of AI or computation as the subject of the story itself: Since AI algorithms are built by humans, AI can also proof itself for unintentional bias in its applications and outputs. Further, there are several new successful applications of AI in newsrooms. One is Wibbitz, a resource used by USA Today to create short videos. Others include News Tracer, an algorithmic prediction tool that helps Reuters journalists gauge the integrity of a tweet and BuzzBot, software from BuzzFeed, which allows the collection of information from on-the-ground new sources. Still, journalists must be careful to evaluate the credibility of AI data, its sources and understand how the algorithms work. Train editors and reporters to incorporate AI as a new resource for storytelling. Develop and promote the use of AI guidelines regarding the ethical use of data. Further, public disclosure of methodology is a must especially in terms of editorial values and standards. Small operations for which AI is too expensive should consider partnerships with academic institutions. Reporters and journalists should continue to be transparent about AI usage in a report or how it’s used in the production of a story. According to The Tow Center and Brown Institute, journalists have two main responsibilities. First, they need to present the information to the reader in a clear and concise manner. And second, they need to explain its authenticity. This includes the practice of AI, including full disclosure of details and formulas for its algorithms. Importantly, as AI helps facilitates the newsroom, journalists need to question and critique the process and the information received. In an age where exclusive content is pure gold and data is the new black gold, smart news organizations are looking for ways to unlock their frontline information and insights for maximum exposure across a multitude of platforms. The Associated Press — a 170-year old news organization with teams in over 100 countries and one of the world’s most important archives of audio-visual archives of news, social history, sports, and entertainment — is going one better. It’s exploring new and rather unconventional opportunities, in areas ranging from data-mining to data journalism, to identify new markets and revenue opportunities for its wholesale and non-profit businesses. Peggy Anne Salz, mobile analyst and Content Marketing Strategist at MobileGroove, speaks with Ted Mendelsohn, AP Vice President, Commercial and Digital Markets. They discuss the company’s mission to expand distribution of its archival content, extract value from its data, and enhance news-gathering capabilities. PAS: On any given day, more than half the world’s population sees AP content. But that’s just one side of your business. Tell me more about your wholesale business and the opportunities you pursue. TM: When I was brought into AP some 25 years ago, the commercial business focused on selling AP content into the federal government, corporate markets, and large clients, including Prodigy, LexisNexis, Dialog. Expanding this by identifying new markets and opportunities is very much what my job is about today. Another part of the business is our retail business, where AP mobile comes into play. The focus is on making our own content available on AP-owned and operated sites and monetizing through advertising. Finally, there are content services, where AP — because of its huge footprint worldwide and access to photographers and videographers — can work together with clients. It’s a service and a business opportunity that we see expanding. are exploring opportunities where brands might sponsor content like the AP Top 25 college basketball or college football rankings. There are also opportunities for companies to sponsor unique content. This might be along the lines of the top 5 things you need to know about ways you can improve health and fitness. We are open to doing more of that and that’s also where having our own platform opens a whole line of revenue and opportunities. TM: Yes, it’s our bread and butter. We’ve noticed that our audience is heavily engaged with our content — stories, photos and video — and that the sessions are long. In fact, in August 2017, a survey from NewsWhip showed that AP drove higher total engagement on Facebook than any of the Top 10 individual publishers in June and July. This achievement is also linked to our ongoing efforts to update our content and add value. We provide alerts, but we also add to the news content from every angle, enhancing the story with text, photos, and video. PAS: You’re using technology to expand and enhance distribution of your content. What is the role of technology in the production of content? TM: AI is a technology that has an impact at several levels. We’re using it, but we’re also educating the media by showing the example of how we use AI within our newsroom. A lot of our efforts around understanding and using AI in the newsroom is focused on producing the routine news, like sports scores, and have them generated through AI technology. But it’s not just about automation; AI can open opportunities for our reporters to cover more important stories and produce the exclusive in-depth content that wins us — and our clients — audiences on mobile and other platforms. And that is what drives the higher engagement. A good example is one of our most successful stories, what we’ve been calling the “Seafood from Slaves.” Here our reporters won the Pulitzer Prize for Public Service for their investigation that exposed slavery in the Southeast Asian fishing industry. PAS: What are the other technologies top of your radar? TM: At one level, AP is a retail store, for lack of a better word. We focus on approaches that will allow us to appeal to our readers directly. We ‘sell’ them on our content on the platforms, such as mobile, where they want to consume it. But it’s also about understanding how other companies and platforms are going to impact how we engage audiences. A prime example here is voice and deciding how we engage with companies that are creating voice-activated content. It means talking to the Amazons, the Apples, and the Samsungs — companies now looking for content that is driven by voice-activation. For us, it’s becoming a new way of engaging with the customer, if you will, by creating content and adjusting our content for this market and working with companies who are attracted by the content we have and the platforms we can serve. In other words, it’s not just the technology that we use internally. It’s working with the companies who are really technology-driven and finding ways to use our content to improve their technology and, at the same time, to make our content available in new and different ways. The number one question for AP is: how do we move our content and make our content play across the platforms? My first boss at AP used to say he wants to ride every horse in the race. And, in some ways, that’s what we’re trying to do. We are on the horse that allows us to display and distribute our content. And we are riding the horses that allow us to get our content to the companies out there that need our content to engage their customers. PAS: AP is exploring AI, launching a VR and 360 video channel in collaboration with AMD, examining the opportunities around voice and Internet of Things. How do make choices about the companies or platforms to explore and the ones to ignore? TM: It’s not about betting on the newest technology or the ‘Next Big Thing.’ You also have to be flexible enough to adjust to what is coming out on the market. As an industry, we couldn’t have anticipated a technology like Amazon Echo and its impact. We also couldn’t have known the content these platforms require. But once it’s gaining traction on the market, like it is now, the best advice I can give content companies is to be flexible. You cannot shut them out; you have to engage. What do I mean by engaging? It starts with the way I organize my group. Specifically, I’ve brought people together who have a focus on vertical segments. Some are in continuous discussions with industry leaders — they are in talks with Amazon, Apple, Yahoo!, and so on. It’s not a discussion like “Oh, we have this content for you, why don’t you sign a deal with us?” It’s a dialog where we want to understand where they’re going and they’re coming back to us with insights on the tech and opportunities that have real potential. 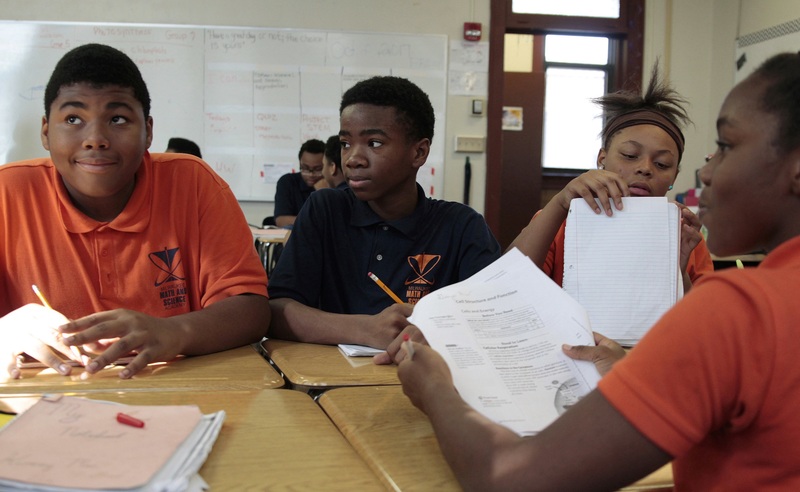 In this Oct. 20, 2017 photo, Jamain Lee, center, looks at classmate Andre’veon Mosby at Milwaukee Math and Science Academy, a charter school in Milwaukee. PAS: Data is hailed as the new black gold, and you have stockpiles of it. How do you view the opportunities in unlocking that data for clients? TM: On the data side — for example, election data — we are the primary source for our clients. We’re finding that election data, even older data, is highly valuable to hedge funds. We make that data available for them to study and make whatever algorithmic assessments they feel necessary based on the data. Data is also at the core of our edge in investigative reporting, identifying trends and news ahead of the competition. For example, an AP analysis of charter school enrollment data allowed us to expose the growing level of racial segregation in schools. Recently we reported on crime in the cities, using the data to take a different perspective. Rather than look at crime growing in cities, we used the data to examine crime in particular neighborhoods. Data allows you to see this, and so we are finding ways to make this data available for our reporters and for other organization to use. PAS: So, data has become a new commodity? TM: Maybe commodity is not the right word. Let’s say it’s a valuable good that we can offer and sell because other companies — businesses, financial institutions, hedge funds — are evolving to use data in ways that we don’t. There are two ways to look at the way marketplace for data is developing. One is the opportunity at the consumer level, where more and better data can improve marketing, advertising, and understanding your audience. The other is the opportunity at the commercial level. Companies need access to data — for example, election data — to identify and understand the trends, and make investment decisions based on the combination of data. It’s early days, and frankly, no one is exactly sure where how data will play out. But we are seeing that a number of financial institutional are looking for data to enhance their own data. It’s why I have some people on the team who are working with financial institutions, trying to understand what they need so we can extract data to make these datasets available in the way our clients want them. TM: Correct. And the third part is being flexible in how you do business. You can’t be limited in how you do business or the kind of business terms you negotiate. All of us in the media industry have models, pricing lists and stuff like that. I threw those models right out because I realized they don’t work. The next technology comes around, and whatever pricing model you have doesn’t work. Instead, you have to adapt to change. You have to adjust your content, and your business model has to be flexible as well. Artificial Intelligence is a term used to describe everything from Apple’s Siri to Google’s Deep Mind and is being leveraged for a wide range of applications from shopping to quantum computing. At its core, AI is the capacity of computing to perform tasks that correspond to decision making and learning by humans. True AI doesn’t just infer or make deductions, it understands natural language, and can develop based upon experience. Today, AI powers everyday tools used by millions of people. With the rising popularity of voice-based interfaces such as Google Home and Amazon Alexa – and the increasingly-accurate recommendation tools offered by the likes of Netflix and Pandora – AI tools are becoming embedded in people’s everyday activities and expectations. Chatbots are another booming implementation of AI. That said, not all of them are powered by AI. As Trish Mikita, AccuWeather’s VP of Digital Media Strategy points out, “There are plenty of dumb bots out there. Many bots are based upon simple decision trees that use a scripted format to (eventually) deliver answers to common questions. Mikita says AccuWeather experimented with this approach in the past, however its latest chatbot leverages true AI. AccuWeather’s chatbot—which was dubbed Abbi in beta — strives to be natural in its conversation. “The goal with us is for users to be able to ask a question, for our chatbot to come with an intent, and then answer the question in a meaningful way,” says Mikita. So, while Abbi can answer questions about the weather forecast, she can also advise on appropriate attire for the day. The idea is for the chatbot to provide an accurate response given the context of a run in Cape Cod or a business meeting in Manhattan. The company is already seeing efficiency savings with customer service. And they look forward to emerging opportunities to monetize these innovations directly. In the meantime, however, the company’s investment in AI is paying off in its ability to better interact with consumers, to get to know them better and to better serve their needs. The Cannes Lions International Festival of Creativity wrapped recently, and there was plenty for advertisers and marketers to chew on as they departed the French Riviera. Throughout the event, several themes emerged that seem poised to shape the rest of the year. Here’s a closer look at three in particular, based upon conversations we had with attending clients and partners. Advertisers want more brand safety. In the digital environment, which is a relatively open ad ecosystem, brand safety has always been top-of-mind for advertisers and agencies. Recently, given very public challenges for some platforms, brand safety is now front-and-center in conversations between brands, agencies and their technology partners. We saw this dynamic emerge at the NewFronts. And it continued – and accelerated – at Cannes. Many platforms have responded by touting Artificial Intelligence (AI) capabilities for weeding out offensive content. But that’s only part of the solution. The most practical fix is for advertisers to work with trusted sources of premium inventory that can combine their supply with leading-edge quality control tools and technology. This is the most effective means of delivering true peace of mind for advertisers and boost brand safety. Trust and accountability remain hot topics. Trust and accountability were part of every discussion at Cannes. It’s clear that advertisers want and deserve deeper insight into how agency and technology partners act on their behalf. They want to know how their money is being spent. P&G is a good example. It announced a review of all media agency contracts this year to extract a broader transparency commitment and more granular data insights from “murky” agency and publisher relationships. That resonated at Cannes, where every buyer was calling for greater accountability across the digital ecosystem. Candidly, we think we led the discussion in how to get there. It starts with the technology vendors and platforms. Advertising technology is the backbone of the industry. So, as supportive partners and category stewards, we have to take the lead and build and refine our services to deliver accountability. Third-party verification of inventory sources and attribution metrics is a first step. But beyond that, platforms need to be proactive, providing buyers with greater access to attribution data, making their technology stacks both vendor and media agnostic, and offering more programmatic transparency in areas like fees, CPMs and bids. Immersive experiences are taking off. Brand safety and accountability are critical. But at the end of the day, helping an advertiser engage their core audience effectively matters the most. To that end, “immersive experiences” were a centerpiece of this year’s event in Cannes, with an emphasis on mobile video. Smartphones continue to grow as a screen of choice for video, rivaling desktop viewership consistently year-over-year. At Oath, we recently conducted a global study that found nearly 60% of all consumers watch videos on their mobile phones every day. We are very close to the tipping point where mobile will soon be the number one video screen. What’s more, the rate at which consumers are adopting immersive, mobile-enabled video formats like VR, 360-degree video and live video, are surging. These types of experiences help brands reach their audiences in new and unique ways, through interactive storytelling. The technology to deliver immersion at scale has also improved, just as the audience’s appetite for immersive content has exploded. Brand safety, accountability, and immersive experiences will continue to dominate industry discussions over the next several months. It will be interesting to see how they shape the ecosystem in the second half of the year. Currently President, Ad Platforms at Oath, Tim has more than 20 years of online advertising experience living in Asia, Europe and the United States specializing in digital advertising platforms, data analytics and programmatic exchange-based technology. As President of Adtech Platforms, Tim’s role is to oversee all of the Demand and Supply Side engineering, product and business divisions that comprises of One by AOL, Brightroll, Flurry and Convertro, among others. Tim came to AOL from the acquisition of Vidible where he was the founder. As CEO, he oversaw the Video Content Exchange Platform that streamlined the way video content owners syndicate their content to publishers. While incubating Vidible, Tim was an Entrepreneur in Residence with Greycroft Ventures, advising portfolio companies such as Klout, Livefyre, elicit and Collective Media. Artificial Intelligence (AI), a computer’s ability to replicate the human thought process and solve problems, is hard at work in today’s news media. And for those not already leveraging AI, the time is now. In the new report, Artificial Intelligence: News Media’s Next Urgent Investment, Martha L. Stone, CEO of the World Newsmedia Network, in association with the INMA, explores how AI is being applied in today’s news industry. Stone explains that AI has three main forms of behavior: natural language processing; predictive analytics; and machine learning/neural networks. Publishers can apply all three forms to address a wide range of news challenges. The first form describes the way in which computers understand the natural language process (NLP). It allows for automatic creation of articles (“robo-journalism”). Both the Associated Press and the BBC use Wordsmith, an NLP automated database, to create huge volumes of stories within seconds. Natural language processing enables speech recognition and is used in devices like Apple’s Siri, Amazon’s Alexa, or Google’s Home. 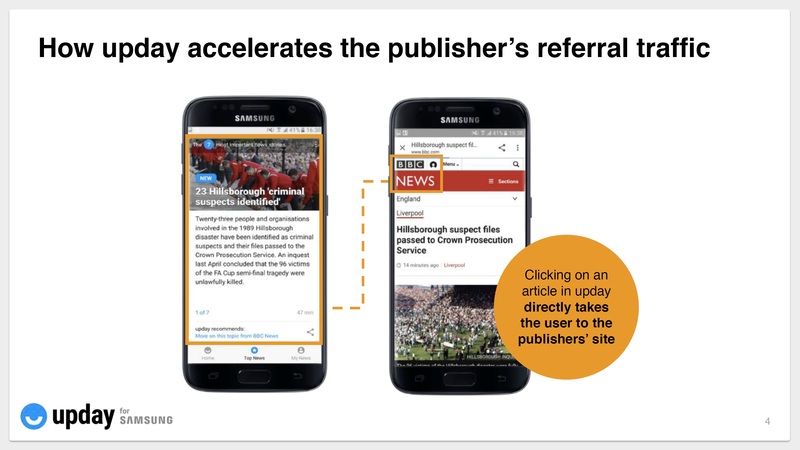 This type of AI process allows CNN, The New York Times, The Washington Post, the Chicago Tribune, Quartz, the Huffington Post, and others to offer “flash” new briefings. Users signal these audio devices to inform them of the day’s news. Media companies use sentiment analysis, a subset of NLP, to identify opinions in social media and blogs. The sentiment analysis sorts through comments about people, brands, etc. by analyzing both positive and negative words used in online discussions. NLP also powers the recommendation engines used by many news publishers. Story recommendations help increase both traffic and user engagement. Chat apps and bots can also be used to drive traffic. However, they are especially good at repetitive tasks such as answering specific questions and offering data alerts. A successful example is The Washington Post’s Facebook Messenger feed bot. Users ask the bot questions and responds to overall news inquiries by suggesting links to other relatable news stories. The second form of AI, predictive analytics, allows analysts to predict trends and behaviors based on a subset of data. Predictive models are often used to target advertising, subscription, or membership offerings. The analytics identify consumer patterns and project the potential the outcome. The Financial Times uses predictive analytics to correlate revenue to content usage and conversion rate to engagement. Schibsted, one of the biggest news media publishers in Europe, uses predicted analytics to identity the gender of their users. Using predictive analytics, Schibsted’s accuracy of gender prediction grew from 15% – 20% to 100%. Demographic assignments are extremely important in serving personalize content and advertising. Likewise, The Weather Channel uses weather trends to help predict the optimal time for advertising. A cold front or snow storm approaching is a perfect time to advertise hot breakfast foods or batteries. The third form of AI is machine learning, which is essentially computers learning to make decisions. Computers identify patterns and apply new logic based on the results. Algorithms allow publishers to make predictions on data, including consumer usage patterns and personal preferences. The New York Times uses machine learning to help identify content for readers. Pinterest uses machine learning to identify relevant user-generated content for their users. Personalization is a great way to utilize machine learning. These practices include recommendations of text and video, location-specific content, segment-based personalization (identifying users or specific products or a demographic, etc.) and newsletter recommendations. Of course, there are concerns that personalization bubbles leave little room for new content discovery. Artificial Intelligence offers support and efficiency in real-time using sentiment and machine based audience analytics. It presents the news media with a way to connect with consumers and provide relevancy. Importantly, the use AI technologies has direct and positive impact on revenue and customer engagement. In the overall smartphone market 84% of consumers (Android and iOS) selected Google as their primary search engine. Looking at specific mobile OS preferences, in Android Google was the primary choice of 90% of consumers; in iOS, its share was 78%. On the desktop, Google commands an 80% share in total, with little variation among Windows, Mac, and Chromebook platforms. Despite this overwhelming share of consumer preference, there are glimmers of a competitive threat to the Google search box emerging from the fast evolving category of AI-powered Virtual Personal Assistants (VPAs) like Siri, Cortana and Google’s own Google Assistant. 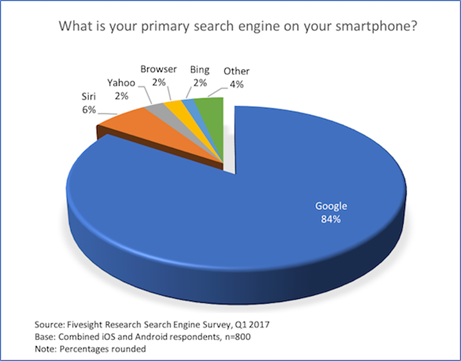 In fact, the Fivesight report showed that Siri is the number two competitor to Google in the mobile space, outpacing traditional search engines like Bing and Yahoo. VPAs represent a new type of consumer interaction with content. This means that publishers need to be considering how to create content and experiences that will play well with VPAs. This is all the more impressive given that Siri is only available on iOS devices, which by most estimates make up less than 50% of the smartphone installed base. And of course, it’s not just Siri. There’s an entire product category of AI virtual assistants evolving both on the smartphone and as standalone home devices. While the Siri and VPA threat to Google isn’t material at the moment, the data suggests a potentially disruptive market shift. Consumers are getting more comfortable with VPAs despite their technical limitations. As the technology improves we’ll likely see even more consumer adoption and possible displacement of some portion of traditional search engine queries. And every query that goes to Siri or Cortana is a lost revenue opportunity for Google. For marketers the change to “traditional” search engine marketing could be significant. The VPA impact isn’t confined to smartphones either. Both Siri and Cortana are integrated into current desktop OS releases from Apple and Microsoft. Siri was introduced to the desktop with Apple’s September, 2016 release of the Mac OS, Sierra. Microsoft’s Cortana has been available on desktops since the introduction of Windows 10 in July, 2015. As these operating systems penetrate more of the installed base it is likely that at least some portion of searches will move to the VPA. In fact, during its Q42016 earnings call Microsoft reported that the Cortana search box had over 100 million active monthly users with 8 billion questions asked to date. For now though, the sheer volume of search activity will keep the traditional Google search box healthy, even with lower cost per click and leakage of queries to alternatives like VPAs. 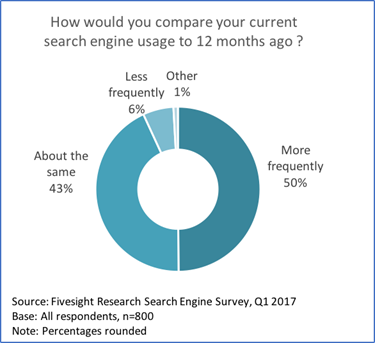 Consumers are searching more than ever, and the Fivesight report showed 50% are searching more than they did 12 months ago, 43% about the same and only 6% less frequently. All of this activity means that keywords and traditional SEO will remain critical tools for digital marketers. VPA queries represent a new type of consumer interaction that will require a fresh approach to content development and audience engagement. It is not too early for publishers and marketers to explore how they will play in an environment where AI powered devices and applications usurp the role of the conventional search box. For starters this means leveraging VPA open APIs to build apps and services that integrate with Siri, Cortana, Alexa and the rest. 15 years ago in his annual shareholder letter, Larry Page spelled out his “dream” for search. Instead of keyword queries and blue links he imagined an AI that would answer spoken questions. Today we are seeing glimpses of that AI powered search. How ironic it would be if Page’s dream turns into a nightmare that fractures the Google search box and the empire built upon it. Joe Buzzanga is Founder and Chief Analyst at Fivesight Research. He has over 30 years of experience in product development, market research, product strategy and industry analysis. 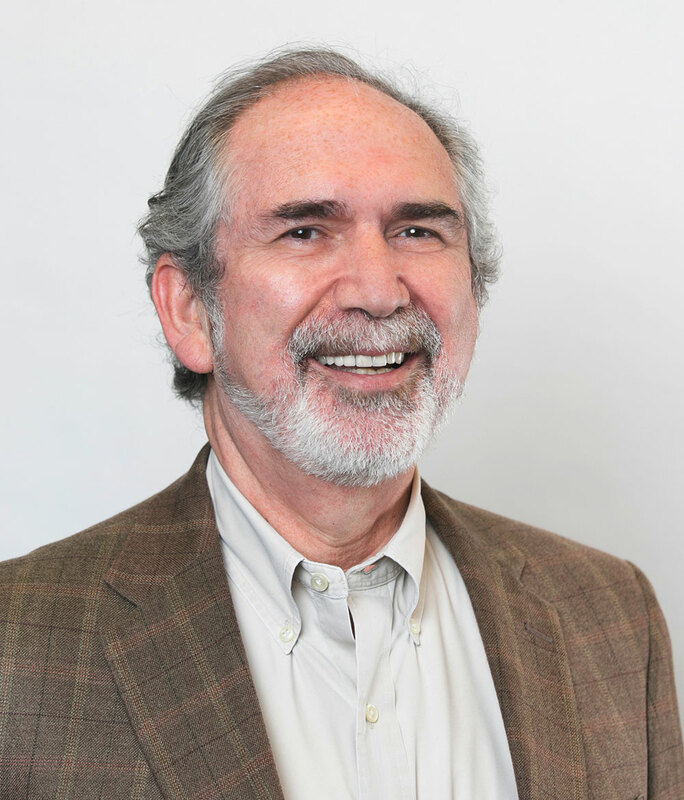 He has a diverse technology background spanning telecommunications (Bellcore/Ericsson, 3Com), semiconductor (Intel), publishing (Elsevier, IEEE) and information retrieval (Elsevier, IEEE). Joe has an MBA from Rutgers University, an MLS from the University of Wisconsin-Madison, and an MA in Philosophy, also from the University of Wisconsin-Madison. *Note: In March, 2017 we surveyed 800 U.S. consumers via smartphone using the Pollfish online survey platform. This sample was split 50/50 between iOS and Android users to provide statistically projectable results both in the smartphone population as a whole and within iOS and Android sub-segments. The sample size yields a 5% margin of error with a 95% confidence interval. The survey was administered via smartphone, but we asked users about their preferences on both smartphones and desktop/laptop computers.